The Warring States period is a particularly interesting time in Chinese history and has exerted a great deal of influence on Chinese thought. Two main philosophical ideologies became part of the mainstream of Chinese thought at this time, Taoism and Confucianism. Confucianism defined the social status of prince and pauper within Chinese society and elected the Emperor a god. It result in a basically feudal and totalitarian system of government that still exists today, in an adapted form. Confucianism impinged on medicine in that it was opposed to the development of anatomy and surgery, one of its main tenets being that the whole body was sacred and should remain complete throughout life and also in death. The Confucians believed that it was important to present oneself to 'the ancestors' whole, and there-fore one of the most feared methods of execution in ancient China was decapitation. Acupuncture and related methods were the logical answer to this constraint, as they were able to cure internal disease with external means. The Tao literally means the 'way' and the philosophy of Taoism is a method of maintaining harmony between man and his world, and between this world and beyond. The Tao, or the 'way', has been linked to a separate creed called Taoism but its basic naturalistic philosophies permeate all Chinese thought and religion, including Buddhism. Yin and Yang are very much part of the Tao, as the Book of Changes states, 'one Yin, one Yang, being called the Tao'. The religion of Taoism became formalized during the Warring States period and a book of poems entitled the Tao attributed to Lao Tsu (c. 500 BC ), describes many of the basic concepts within this philosophy. The Taoist concept of health is to attempt to attain perfect harmony between the opposing forces of the natural world, between Yin and Yang, the belief being that the only way to be healthy is to adjust to the natural forces within the world and become part of their rhythm. It is further realized that the natural forces are completely dependent on each other; earth is dependent on rain and rain is dependent on heaven, which in turn cannot exist without the earth. In the same way Yin cannot exist without Yang, and yet the two are opposites. The concept of a unified, but at the same time polar force, governing natural events, is central to much of Chinese thought. At first glance these concepts seem to be an irrelevant side-line to the development of a system of medicine, but acupuncture, and its development can only really be understood if the reader grasps the traditional Chinese approach to health and disease In essence, the ideal of health is perfect harmony between the forces of Yin and Yang; this represents the correct 'way' or Tao. Disharmony brings disease and death. Taoism is a passive philosophy, exalting the art of detailed and accurate observations. This was also an essential part of the development of Chinese medical thought and allowed detailed observations on organ structure and function to be made, as discussed in the first chapter. As acupuncture developed, the Bian stones were discarded and needles of stone and pottery were used. These simple, primitive needles are still used in some of the rural areas of China. Eventually metal needles began to appear and these took the form of the classical 'nine needles'. The 'nine needles' comprised the arrowhead needle for superficial pricking, the round needle for massaging, the blunt needle for knocking or pressing, the three edged needle for puncturing a vein, the sword-like needle for draining abscesses, the sharp round needle for rapid pricking, the filliform needle, the long needle for thick muscles and the large needle for puncturing painful joints. The main needle now used for acupuncture is the filliform as most of the others have been replaced by more sophisticated surgical instruments, for instance, the sword-like needle has been replaced by the scalpel. The 'nine needles' were initially made of either bronze, or gold and silver, and seem to have been first used about 2,000 years ago. The tomb of the Prince of Chungshan, dating from the second century BC, was excavated in 1968 and contained a set of nine needles, four being of gold and five of silver. 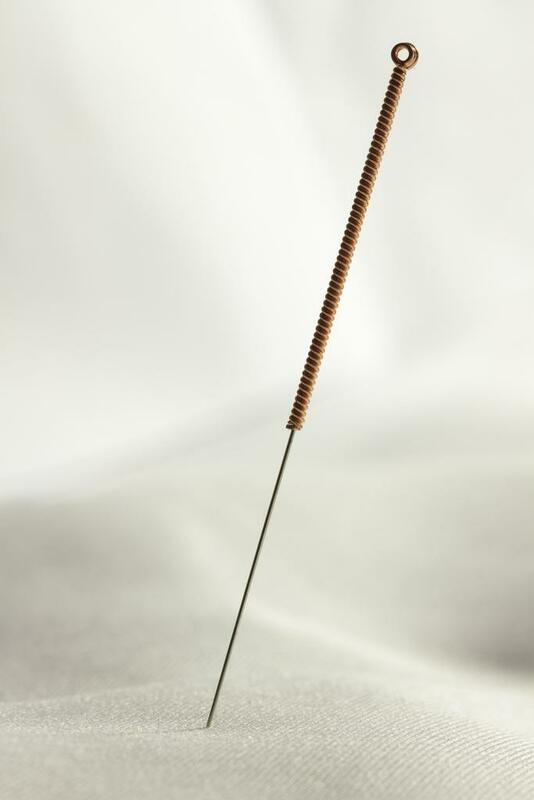 Some acupuncturists use gold and silver needles but the majority only stainless steel filliform needles. A discussion of the history of acupuncture is incomplete without mentioning moxibustion. Moxibustion is the burning on the skin of the herb moxa. The Chinese character 'Chiu' is used to describe the art of moxibustion, and literally means 'to scar with a burning object'. Moxibustion does not now involve scarring, but moxa is still used to provide local heat over acupuncture points. It is made from the dried leaves of Artemisia vulgaris and the Chinese believe that the older the moxa, the better its therapeutic properties.